ESB Brain Wave: Has Online Poker Peaked? PartyGaming (UK:PRTY) shares lost a third of their value last week after the online gaming company hinted that the boom in the popularity of online poker may be starting to wane less than three months after an IPO raised just under $8 billion from investors. Results on the surface appeared quite positive. PartyGaming, owner of the popular PartyPoker.com, said first-half after-tax profit climbed 23.8% to $171 million, with EBITDA excluding share option and IPO expenses up 70% to $257.7 million. Revenue climbed 81% to $437 million on strong growth in poker. The number of daily active players rose to 123,447 from 60,738. So why did investors flee the stock leaving the company with $4 billion less in market cap? PartyGaming announced that it expected slower growth rates from its online poker business in future quarters. In addition, although new sign-ups were in line with expectations, more casual players joining its site weren't spending as much as its initial core of users. The yield per active player per day slid to $17.80 from $19.20. PartyGaming said it would lower its spending on advertising and marketing and prioritize customer retention. In addition, PartyGaming has faced increasing competitive pressures in the key US market. Part of the reason is the onset of competition from WPT Enterprises (Nasdaq:WPTE) and Sportingbet (LSE:SBT), which runs the Paradise Poker website. With only 15% of its active players from outside the U.S, the group is seeking to expand into other countries as well as diversifying away from its core poker market. With this valuation correction, should you now buy shares of PartyGaming? Unfortunately you don’t even have that option. 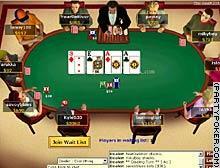 Because hosting online poker in the US is illegal, Americans can not even hold shares of the London-based stock.